Lemon Meringue Pies are a particularly nice treat in the spring and especially for Mother’s day. So I thought why not make them in a jar. I love lemon. Lemon meringue pies are one of my favorite kind of pie. What gave me the idea for happened while I was watching Paula Deen on TV where she was making her lemon meringue pies. 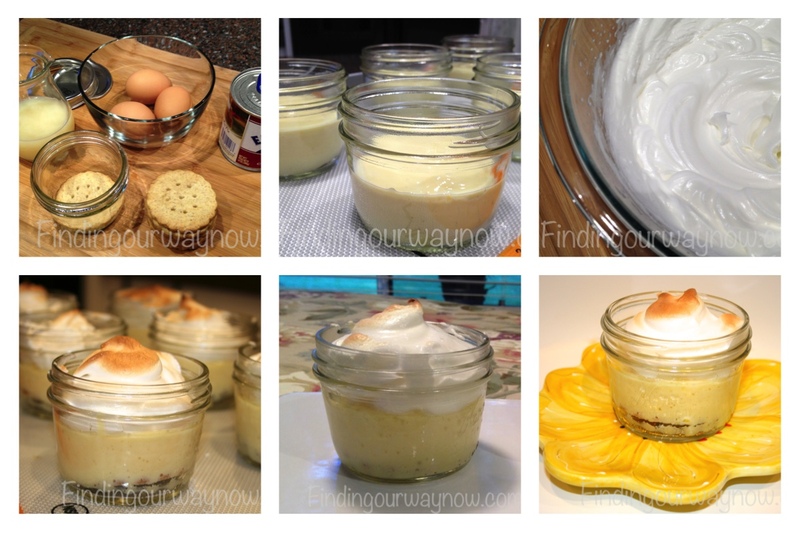 After making my Mac & Cheese in Jar, I thought it would be fun to see if this same concept would work for my mini lemon meringue pies. I’ll let you be the judge as to how these Lemon Meringue Pies In A Jar turned out. :-). Ingredients: Makes 6 mini pies. In a medium mixing bowl, combine sweetened condensed milk, lemon juice, and zest, than add in egg yolks one at a time until combined. Place a cookie in the bottom of each jar and divide the filling equally between each of the 6 canning jars. Bake for 10 to 12 minutes, until the filling is just set, it may be a bit jiggly in the center. With an electric mixer, beat the egg whites with cream of tartar until soft peaks are formed. Gradually beat in the sugar until stiff peaks are formed and the sugar is dissolved. Transfer the meringue to a piping bag with large whole tip or a Ziploc bag with the corner cut off. Pipe the meringue over the surface of each pie. Turn the oven broiler on and place the meringue-covered pies on the top rack near the heat and cook for 1 to 2 minutes until the meringue starts to brown. (If you prefer, you may use a kitchen torch to carefully brown the meringue on top of each pie.). Allow the mini pies to chill in the fridge before serving, or store in the refrigerator covered for up to three days. Notes: You can use bottled lemon juice or freshly squeezed lemon. The fresh lemon juice has a much brighter flavor in these Lemon Meringue Pies In A Jar. If you aren’t interested in the meringue, you can serve it topped with whipped cream. 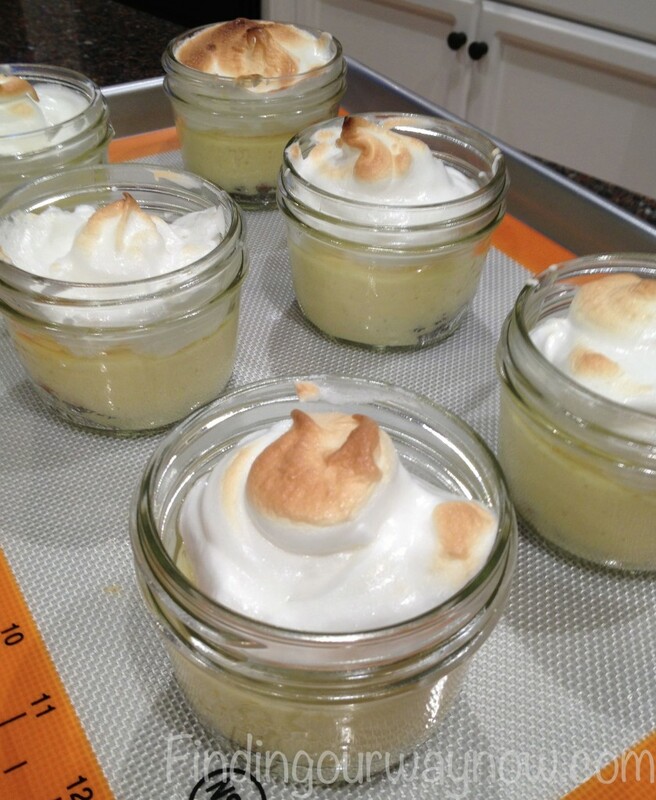 One last thing these cute Lemon Meringue Pies In A Jar will keep well, lidded, in the fridge. These little gems were a very big hit. As you can imagine they lasted a nano second. I’ll need to make double the amount the next time to ensure that I have leftovers for my friends (and me). 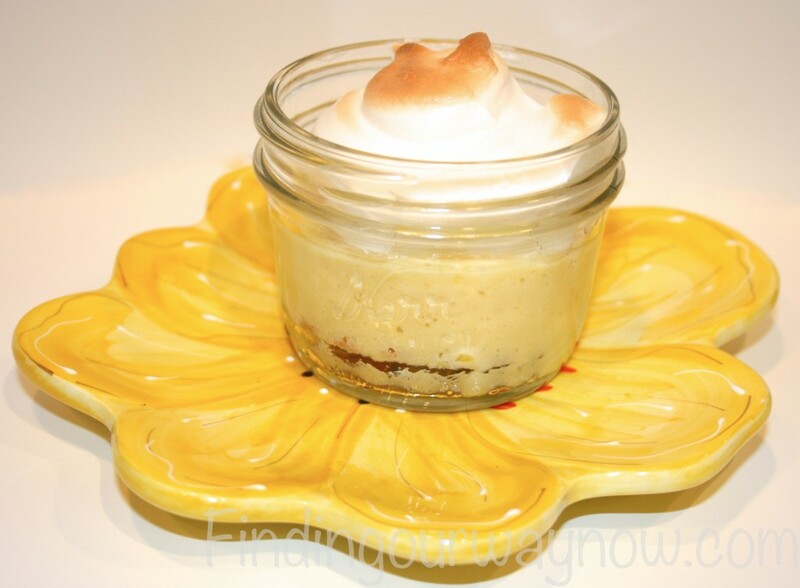 If you enjoyed this Lemon Meringue Pies In A Jar, check some of my other recipes such as these Pumpkin Pie In A Jar, Chocolate Mousse Pie In A Jar and Macaroni and Cheese In A Jar.